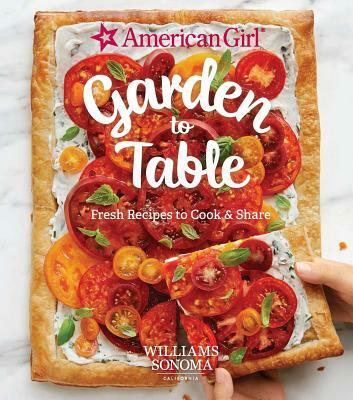 New in the best-selling American Girl cooking series are more than 50 recipes for kid-friendly dishes that highlight seasonal ingredients, Garden to Table will inspire young chefs to learn about eating fresh food—and cooking delicious (and nourishing!) dishes while perfecting kitchen skills and knowhow. Garden to Table features 50+ recipes for sweet and savory recipes that transform fresh produce into delicious dishes—like whipped-cream cake with layers of berries; mini peach and cherry pies; pink-frosted strawberry cupcakes; sweet potato skins topped with melted cheese; tempura fried string beans with yummy dipping sauce. In addition to essential cooking tips and kitchen safety knowhow, discover fun skills like using a vegetable peeler to “shave” veggies and tips for creating an indoor kitchen herb garden. Whether you want to make the perfect after-school snack for yourself, a decadent dessert for a party with friends, or dinner for your family, this beautifully photographed collection of recipes will inspire you to cook your way through the seasons—and through each chapter, from the veggie garden and berry patch to the fruit orchard and citrus grove. With this garden-to-table adventure, become a pro at transforming beautiful fresh fruits and veggies into super-delicious baked treats and meals.